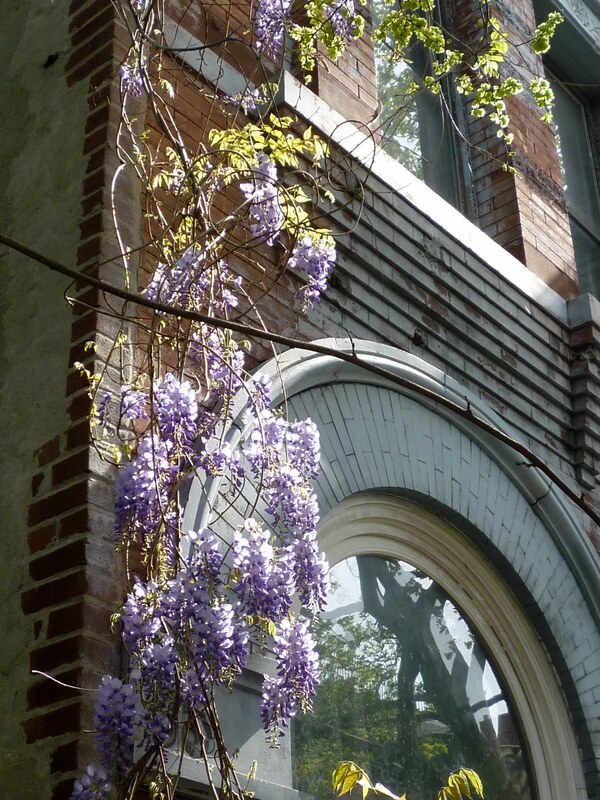 The 103-year-old United Presbyterian Church of Ridgewood is for sale. The always tasteful folks at Massey Knakal tell us "The subject property is comprised of a 12,868 SF religious building (seating for approx. 850-1,000) and 2-story single-family residence on an adjacent tax lot. The site features approx. 127' of frontage on 60th Place and could be utilized either as part of the community facility or re-developed as a residential rental or condo/co-op project. The two adjacent tax lots combine for approx. 23,721 buildable SF for residential and approx. 35,142 buildable SF for community use. The entire property may be delivered vacant upon closing, making it ideal for a user, investor or developer." 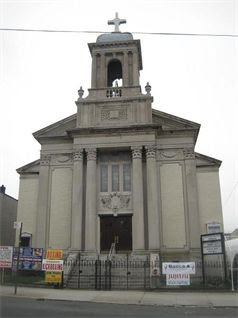 The congregation dates back to 1862, then called the First Presbyterian Church of East Williamsburgh, meeting in a little wooden church on the site of the present structure. The current building is Renaissance-style building and has stained glass windows imported from France. 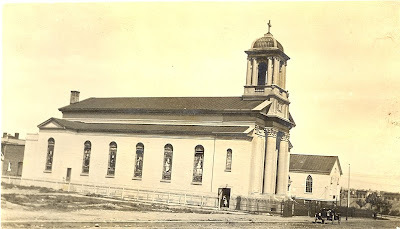 The dedication took place on May 22, 1910 when the congregation numbered 500 and there were 750 pupils in the Sunday School. The United Presbyterian Church of Ridgewood came into being when the St. James United Presbyterian Church, also of Ridgewood, made overtures to unite. The merger of the two churches took place in October 1993. Check out the building back in 1913, below. Not much around. Lost City Asks "Who Goes to La Rivista?" A couple more years of "Who Goes There?" and I will have made it through a good chunk of Restaurant Row. The son of the owner of La Rivista—for 25 years the first stop on the right as you walk west on Restaurant Row—opens bottle after bottle of Peroni at the bar. All the beers will go to the big table of middle-aged officemates making noise in the center of the restaurant. They've been here before. They call the graying, dignified, tuxedo-clad maitre d' "The boss," and testify that every dish—the mussels, the melon and prosciutto—are as great as ever. Twenty generous plates of appetizers and antipasti are devoured before the table is given menus. Now it's time to decide what to eat. 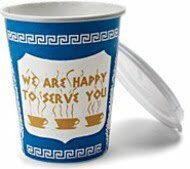 It is, of course, the Anthora, the cardboard cup of Grecian design that has held New Yorkers’ coffee securely for nearly half a century. Introduced in the 1960s, the Anthora was long made by the hundreds of millions annually, nearly every cup destined for the New York area. No. 12 Gay Street needs a little work. The beautiful old Federal-style house has wood over some of its broken windows and, according to red sign on the door, no interior floors! 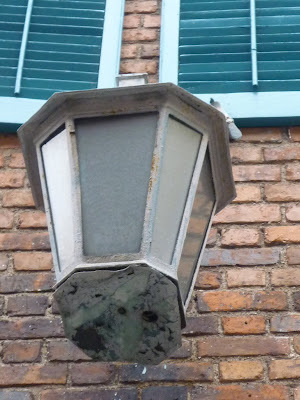 I wonder if the prominent lantern on the outside of the building was Walker's cheeky way of showing this was an unofficial Mayoral residence. In those days, Mayors' home were adorned with two lanterns (as Walker's St. Luke's Place home still is). This metal arch in the street-level gate made me wonder if the address' basement level was ever a place a business. Possible. 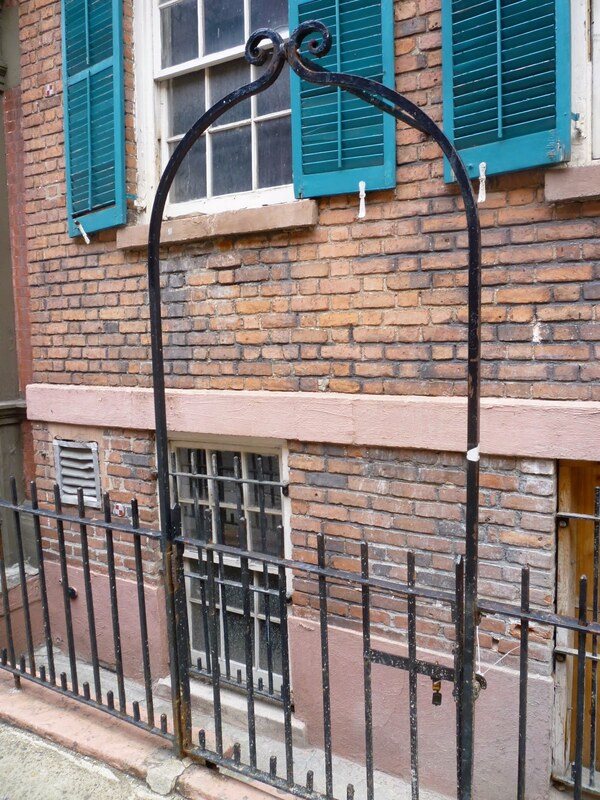 Some accounts say that, during Prohibition, 12 Gay Street house a speakeasy called Pirate's Den. 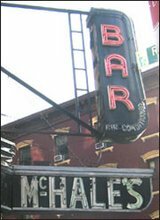 Often speakeasies cropped up exactly where bars used to be. 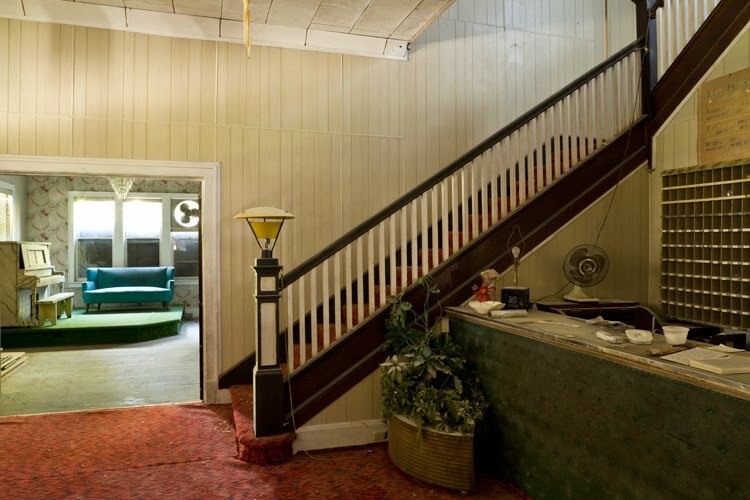 More weirdness followed when Frank Paris, the puppeteer who created Howdy Doody, lived here. Paris saw a ghost. Actually three, including a man wearing a black cape, vest and top hat. Sounds like Jack the Ripper to me. 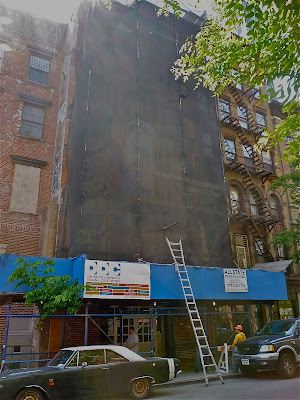 The DOB issued a stop work order on the property on Sept. 15, 2009, when the facade was seen to crack during some permit-free construction work. The work was also causing surrounding buildings to shake. As we say in preservation circles: Not good. 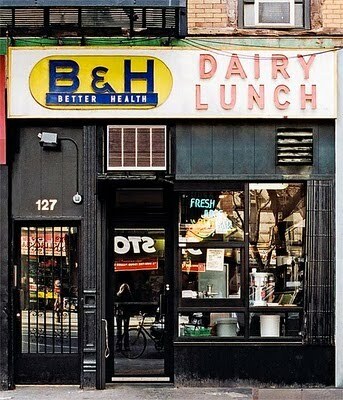 Last week, we preservation geeks all gasped in horror when B&H Dairy in the East Village took down their classic old sign. Would it return? EV Grieve has been following the story closely, and Tuesday posted pictures of the new sign, which is exactly the same in font and style, except that it's, um, green. Kelly green. EV took a reader survey, and the result was 9 to 3: they don't hate. I also don't hate it. 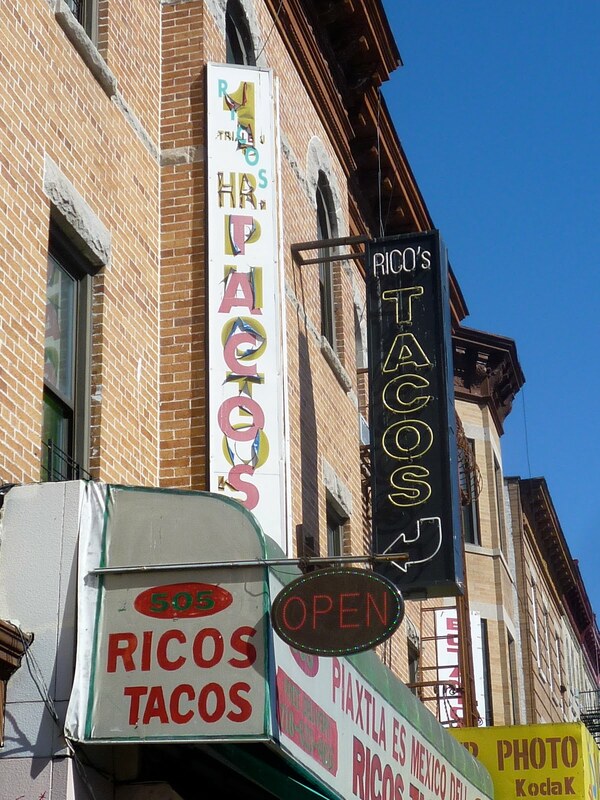 But, what I want to know is: Is it the exact same sign, only spruced up and painted green? Or is it an amazin facsimile? The old sign is below. I've pretty much been ignoring Trump SoHo, because I always ignore that tackless vulgarian and his horrendous, taste-free, ego-trip construction projects. But I was walking across Sixth Avenue, look south and saw this. Kind of insists itself upon you, doesn't it? 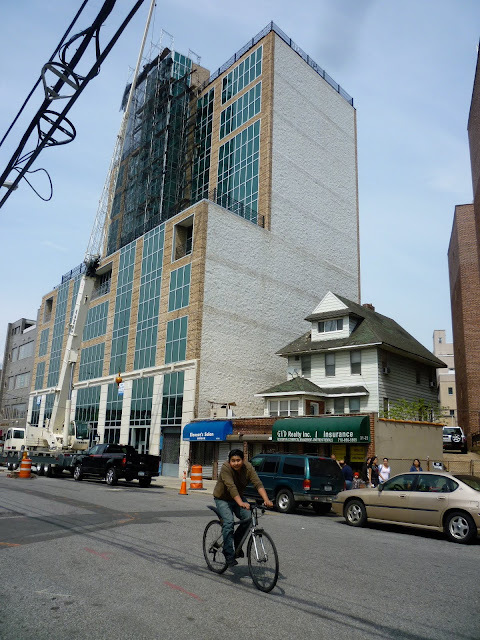 How did a building that tall ever get approved in such a low-lying neighborhood? Waverly Wines has moved from its longtime perch on Waveryly Place to a new place on Sixth Avenue. 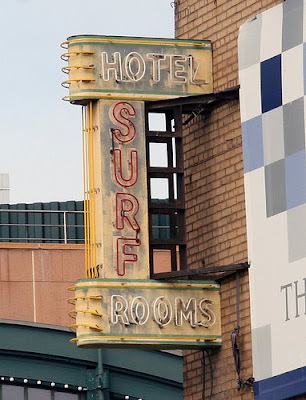 But the great old neon sign is still handing there. What's going to happen to it, I wonder? Forget About the Time, Just Buy More Office Supplies! Here's the big old Staples on Sixth Avenue in the Village, where the Emigrant Savings Bank used to be. It was always a plenty ugly building, but one of the great things about it was the lighted sign on the south side that told the world the time and temperature. Very helpful. Very civic-minded. 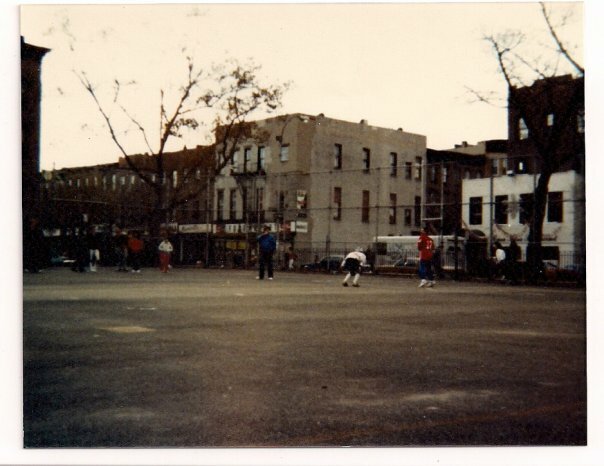 Carroll Park, Brooklyn, in the late 1970s, looking toward the intersection of Carroll Street and Court Street. Tapes on the door at LA Cleaners on Union Street in Carroll Gardens. It gave me pause as I prepared to lug my enormously heavy dry-cleaning home. On Smith and Warren in Boerum Hill. You can't really see here, but there are about 10 giant pallets of stuff. The amount of waste these big box stores produce on a daily basis gives me the chills. 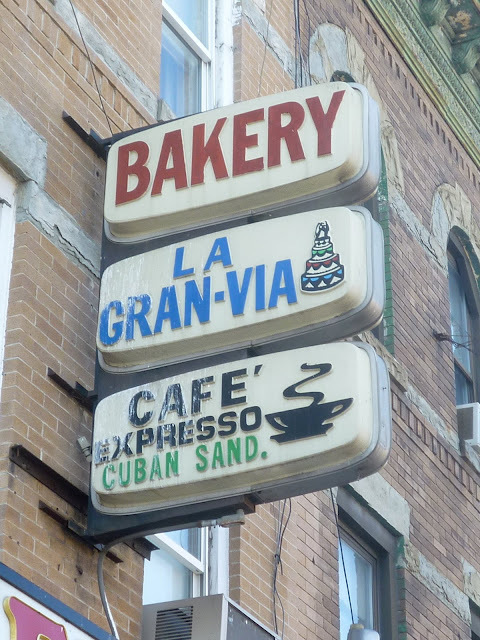 I had a feeling, looking at it, that Crater Candy Store on 30th Avenue and 31st Street in Astoria, Queens, was pretty old, despite the bright-blue Lotto awning and the typical bodega patina. It may have been the name, which reminded me of the notorious Judge Crater. People named Crater don't found delis anymore, or at least don't name delis after themselves. It's such a 19th-century-sounding name. In Astoria. One of the hugest neon liquor signs I've ever seen. Never encountered that font before, either. 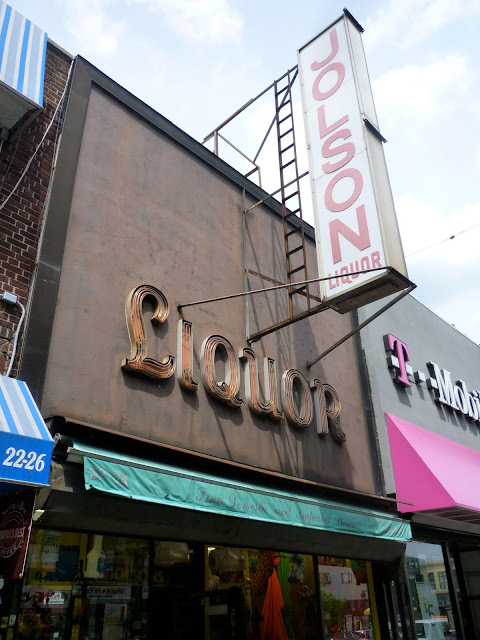 Liquor neon usually goes for boxy, block letters. Jolson's is about as old as a liquor store can be in America. It was founded in 1935, one year after Repeal. Anyone every seen this bizarre cutout illustration on Roosevelt Avenue in Woodside? It adorns one of those cut-rate discount stores. That faceless pair of running legs, why, he's got it all! And fetched quite a bargain on those king-size greeting cards! But boy is he going to be made when he gets home and realizes he's dropped that package of automotive supplies. This storefront in the once-heavily Polish South Slope was a Polish grocery as recently as six months ago. Times change. The new business looks like a nice mom-and-pop operation. I wish them luck. There's nothing new about the Gowanus business Four and Twenty Blackbirds. The pie company has been open only a few weeks. But I love the Olde English look they've given the industrial building they work out of. Reminds me of many a whitewashed shop I've encountered in quiet English villages. Modest and handsome. Progress is having its way with Admiral's Row. The decaying, but beautiful and historic, row of ancient military homes along City-owned Brooklyn Navy Yard, will be torn down to may way for a 55,000-square-foot ShopRite, along with 30,000 square feet of other new retail space and 125,000 square feet of industrial space. 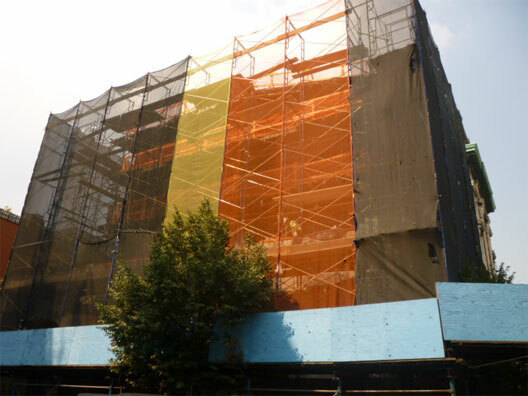 "I can’t wait until that wall is demolished," said genius Councilwoman Letitia James. "It creates psychological barriers for the entire neighborhood." Ugly big box stores create their own headaches, too, Letitia. James said the new ShopRite would be a "destination supermarket like the [Pathmark] at Atlantic Terminal Mall" in Fort Greene—which is another visual beauty, as we all know. And it will finally give the neighborhood a convenient place to shop, she said. Because convenience always trump historical heritage. 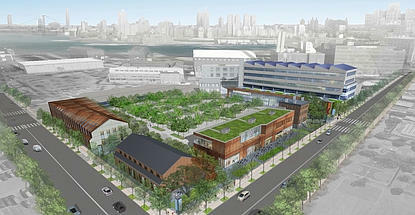 The project, which is expected to break ground by early 2012 and be finished by 2013, will provide 500 (lousy, low-paying) permanent jobs and 500 (here-today, gone-tomorrow) construction jobs. Those happy construction workers will have the privilege of demolishing nine historic buildings. One single former military residence and timber shed at Admirals Row will be restored and incorporated into the development. And here's the icing on the cake: The project will also provide more than 300 parking spaces for the new businesses. Ran into these two triple-decker signs, advertising businesses right next door to each other, on Fifth Avenue in Sunset Park. I love these sorts of signs. 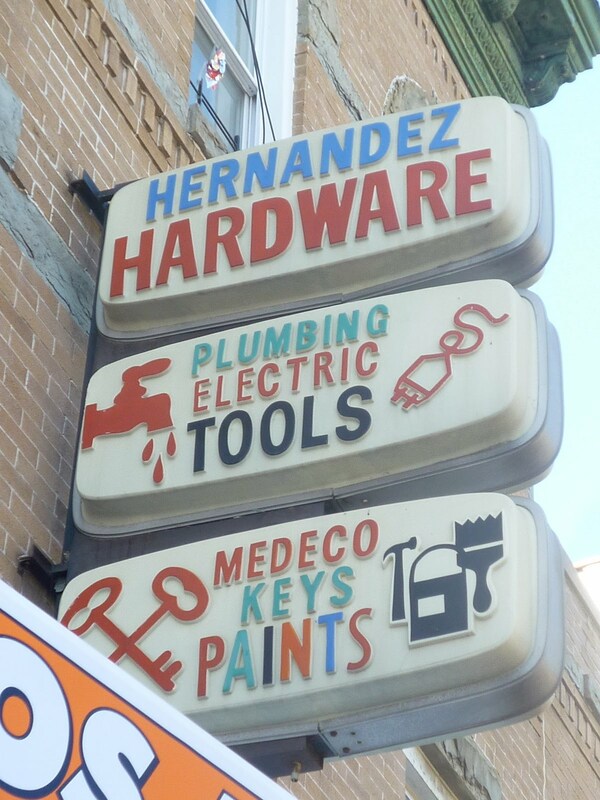 The sign shapes are uniform and classic, but the raised lettering and images are usually very specific. O'Hanlon's, an Irish bar in Astoria, is about 60 year old. 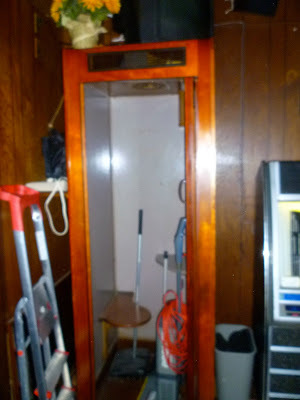 Old enough to have a wooden phone booth. O'Hanlon's phone is unique, in that it's not a stand-alone booth but is built into the wall, a permanent part of the bar. I've seen this sort of thing at Fedora and Bill's Gay Nineties. It doesn't have a folding door, like most do, but a simple one-panel, open-and-close portal. The phone inside works. The bar has to pay the phone company for that service, and is thinking of disconnecting the line. There is no fan inside. 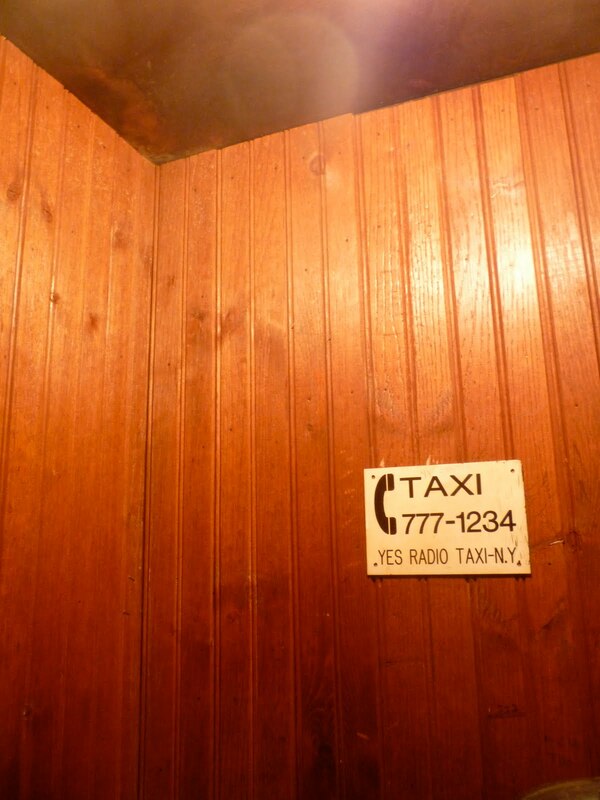 But there is a phone number for a taxi service. Previous Wooden Phone Booth Sightings. One of the loveliest businesses in Astoria is the La Guli Pastry Shop on Ditmars Boulevard. Family-owned, this store has been dispensing handmade sweets, pastries and gelato since 1937, always at the same location. The family is hands on, the old owner there when I visited, busy straightening chairs and making sure everything was running smoothly. 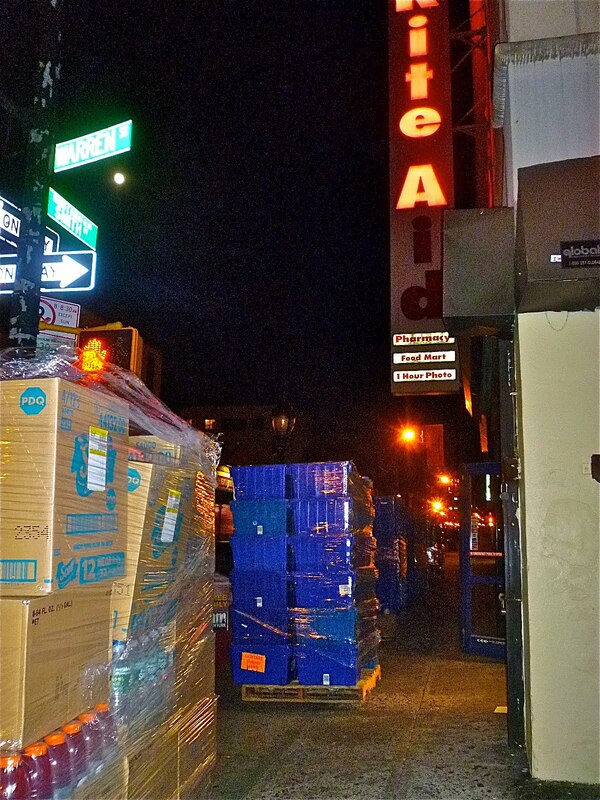 Cobble Hill Scofflaw Gets Sued By City; The Weirdest-Looking Development Site in the City; Strangest Building in East Village Gets a Little Work Done; The History of Helen's Candy Store; A Visit to Joe's Pork Store in Astoria; A Wooden Phone Booth Sighting; B&H Dairy Sign Comes Done. 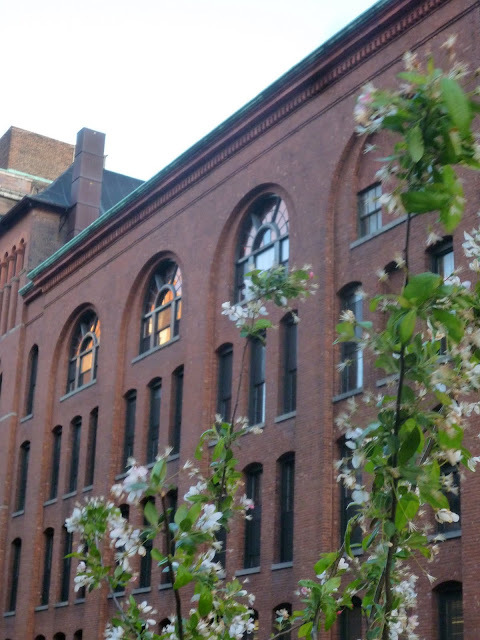 The Landmarks Commission is doing right by Cobble Hill landowner John Quadrozzi. Anyone who's ever walked down Henry Street in Cobble Hill has seen Quadrozzi's good works. 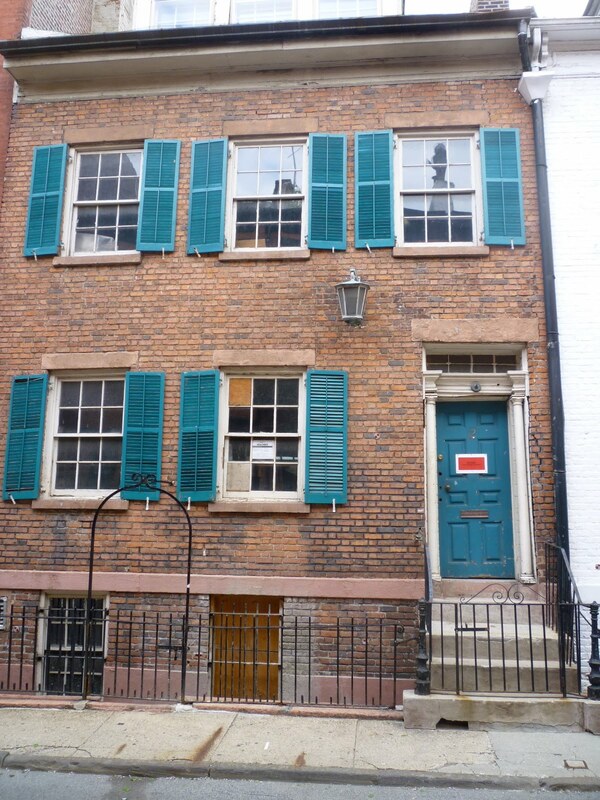 The owner of a few landmarked brownstones, he has willfully let them fall into disuse and disrepair. The disaster he owns at the corner of Henry and Congress (above), built in 1852 and ever in danger of crashing down, has been in scaffolding and netting for forever, blighting the intersection. According to the Daily News, Quadrozzi claims "unwieldy city bureaucracy has delayed his renovation efforts for years." "It took me over a year and buckets of money to convince them [a wall] might collapse," said Quadrozzi, who bought the buildings in 2000. No doubt, the red tape surrounding landmarks is a pain, but 10 years and you couldn't figure it out? Doubtful. I've talked to Quadrozzi's neighbors over the years, and they always told me similar stories of a neglectful and absent landlord. How long have we been waiting now for the MTA to finish construction on the "Big Stair" complex leading up to the No. 7 Court House Square station? A year? Two? An eon? 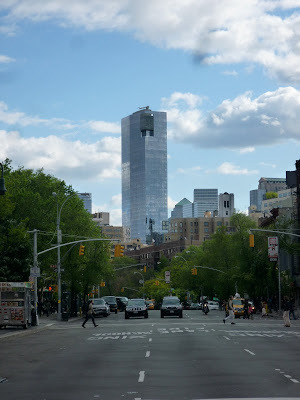 It's a brand new world for The Strangest Building in the East Village. After years of rusting, being boarded up, being painted an awful shade of tan, and just being plain weird-looking, old No. 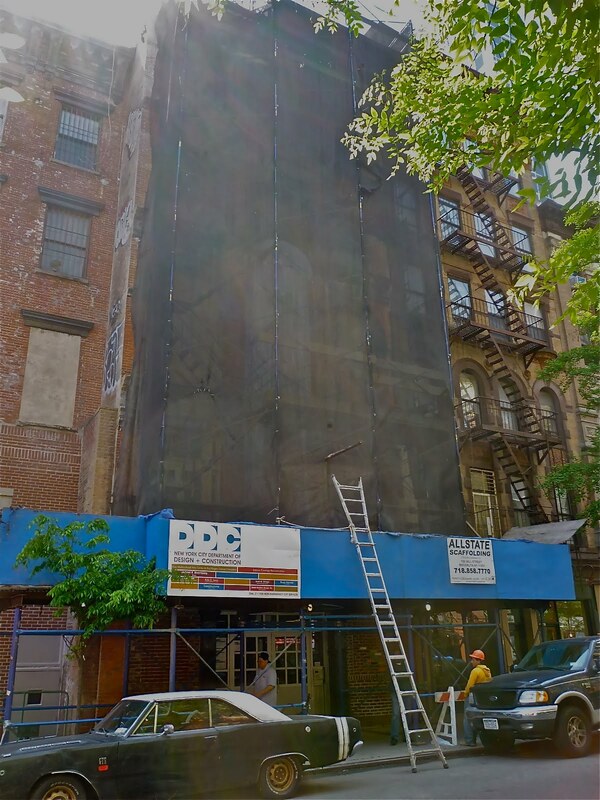 62 E. 4th Street is getting a new lease on life. The ugly paint has been scraped off and the brickface is being repointed. 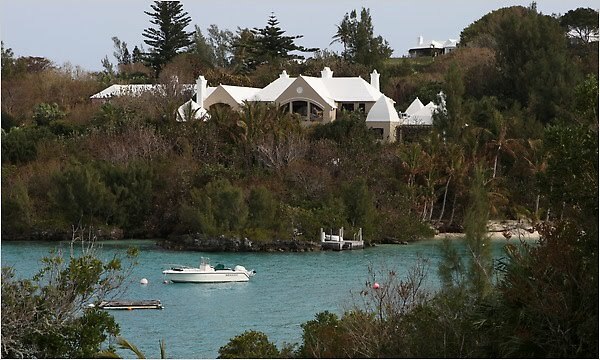 Where would you want to live, the tower or the old house? This shot, taken in Astoria, makes me think of "Up," where the old man stubbornly stays in his house as skyscrapers rise all around. There's a car in the driveway, so someone still lives in the house. Someone who can no longer see the sunset. 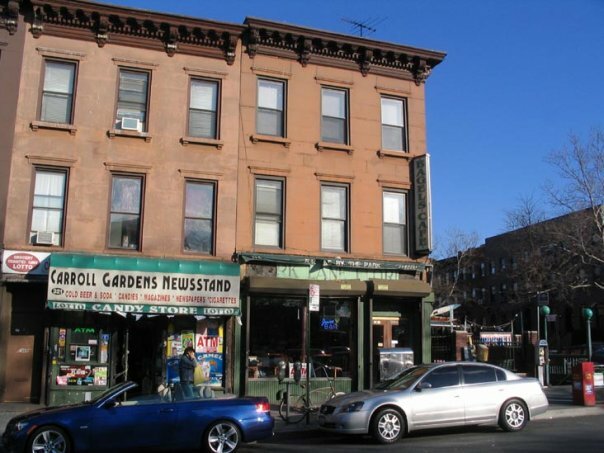 The Carroll Gardens Newsstand on Smith Street, a couple doors down from the Gowanus Yacht Club, always looked way too old to me to not have had an interesting history. It had wooden frontage, one of those set-back entrances, and odd window configurations on either side. I often wondered what the space had been before the newsstand came along. I learned some history recently. And the address was exactly what the little storefront looks like it might had been—a candy store. Specifically Helen's Candy Store, an apparently beloved local institution, know for its superlative egg creams. Kids spent hours inside and outside the place. 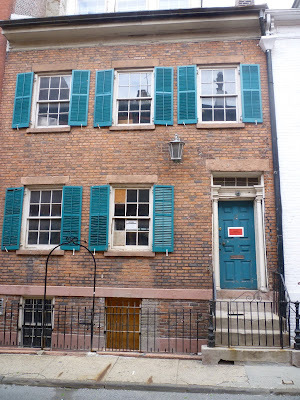 It was run by two sisters who lived upstairs, Helen Hanaway, who had a reddish-blonde beehive hairdo and Georgia. But they didn't apparently work the counter. Joe's Pork Store is in Astoria, on Ditmars Boulevard near 37th Street. It's been there since 1957, and is worth a visit. It's hard to find a place more authentic than this. 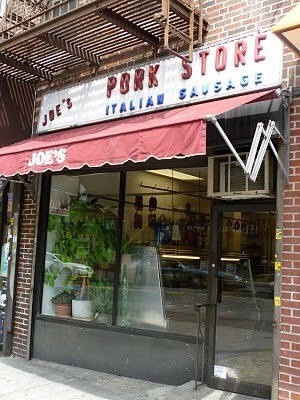 Joe's son Paulie, who currently runs the place, and makes all the delectable sausage, is a third-generation butcher. His grandfather had a shop in Harlem. 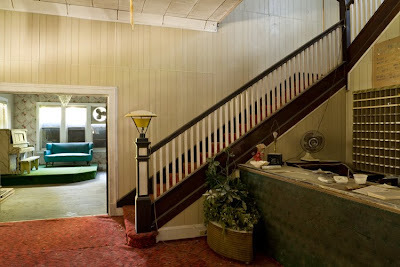 The old cash register and butcher block from the Harlem shop can been seen inside. So can a meat chopping machine that Joe bought in 1957. It looks like new and has never been repaired. It's a delight to visit this store. There's sawdust on the floor. The owner is happy to talk and seems to very much like what he does. He's not grumpy, as some butchers I've met can be. He'll give you tips on how to best to keep the flavor of the meat as your cook it. And the prices are very good. Down the street is this little wall painting, pointing the way to Rico's. 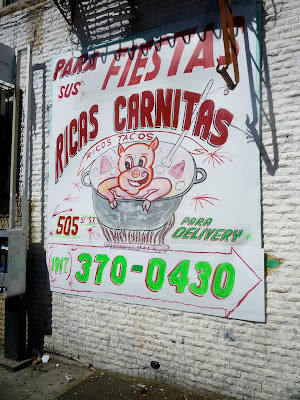 Like all pigs that help advertise butchers and restaurant, this little porker looks very happy that he's about to be eaten. View through the skylight in the back of the House of Pizza and Calzone. 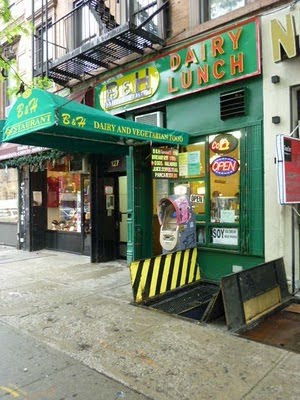 This is rather off-topic, but I thought the subject so quirkily New Yorky that it was worth blogging about. I have a friend who like to grill meat. So much so that he goes in with a dozen or so friends and acquaintances to buy a bespoke cow from a farmer upstate. This ensures them quality product, as well as the peace of mind of knowing where your meat is coming from. When the animal is butchered, the meat is driven down to Brooklyn where the investing parties gather in my friend's backyard and divvy up the shares. I always thought this would be an interesting ritual to observe, so I asked my friend to let me know the next time his cow came to town. 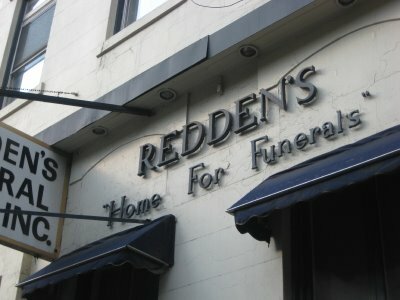 Redden's, on 14th Street, is one of the oldest funeral homes in the City. It was founded in 1919. You'd think their reputation and experience would be enough to keep them going. But I guess even funeral parlors need a glitzy makeover in Bloomberg's Luxury City. Redden's recently traded in their old sign for the gilded version seen above. It's Trump classy. It's springtime on the High Line, and the flowers are blooming against a backdrop of brick warehouses, parking garages and ruined piers. The contrast is nice, if you look at it the right way. 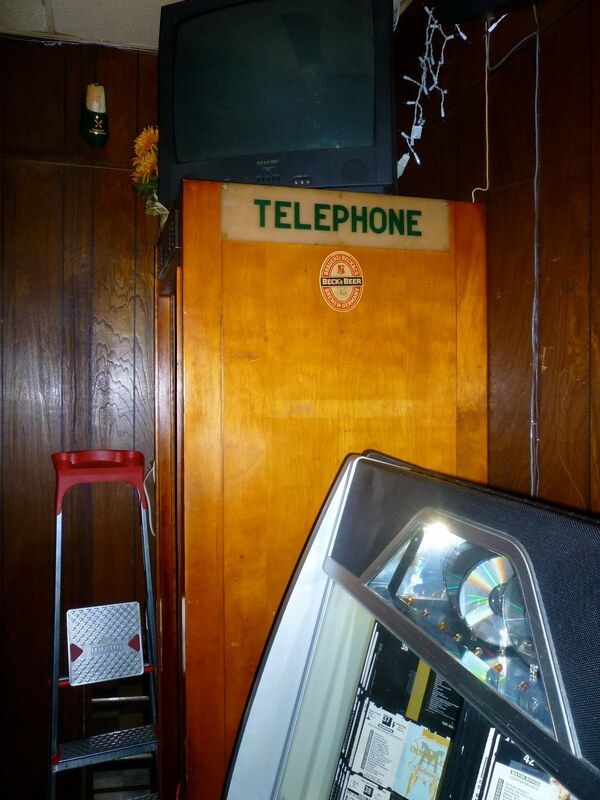 Last week, upon walking into the old Glendale German restaurant Von Westernhagen's my eyes were nearly yanked out of my head by the unexpected sight of a wooden phone booth. Von Westernhagen's is only 46 years old. One doesn't expect a restaurant rounded in 1964 to have a wooden phone booth. A phone booth, yes, but not a wooden one. 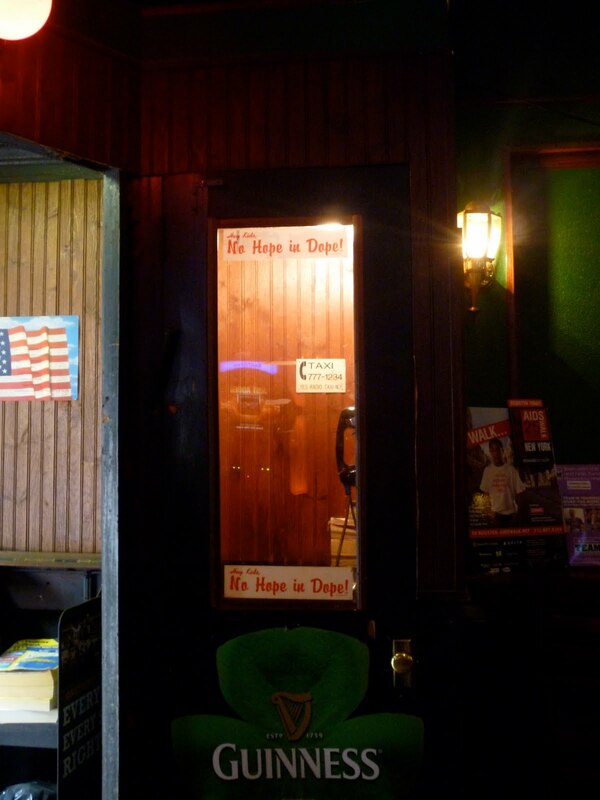 Unfortunately, the booth is not is working order. The phone company pulled out the phone some time ago. The restaurant is looking to see the booth. 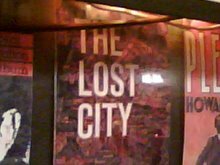 Lost City Asks "Who Goes to Von Westernhagen's?" Tammany Hall Scions Need to Connect! Lost City Asks "Who Goes to Puglia Ristorante?" 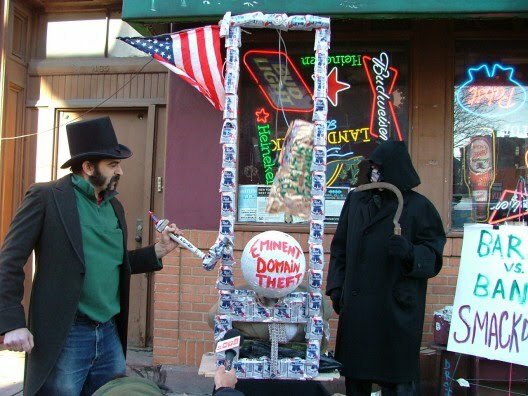 Greenpoint's Manhattan Furrier In Peril?